In order to finish the degree of Media Informatics successfully, you will have to attend a number of different courses. This section gives you an idea about the offered modules and the lectures, seminars and practical courses they consist of. You will also find the number of ECTS credits you can earn with the successful completion of a course. 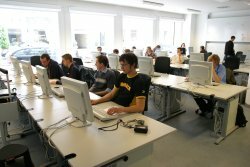 Students of Media Informatics must select one out of three secondary subjects on offer, all of which have a strong link to media: Medienwirkung (communication science), Medienwirtschaft (economics) or Mediengestaltung (fine arts). Lectures of the individual subjects may not be mixed! For each secondary subject, we have compiled a proposed semester plan for all six semesters. A module is a container for a number of lectures and other kinds of courses which have similar content and educational objectives. It can take one or two semesters to complete a module. There is a Pflichtmodul (which has to be completed in order to graduate) and also a Wahlpflichtmodul (which can be chosen from a number of different modules). Please refer to the conditions of study to see which modules you have to complete in order to graduate. The overview contains titles, module IDs, content and the educational objective of the different modules. The modules belong to different areas of Media Informatics, such as IT, mathematics, and the secondary subjects. 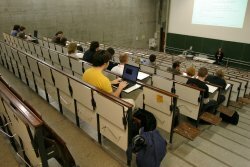 Lectures (Vorlesungen) are the most common teaching mode. The aim is mainly to give the students a theoretical knowledge of the subject. Registration to attend a lecture is (most of the time) not required, the number of participants is not limited. Credit points will be obtained in written examinations (Klausur). 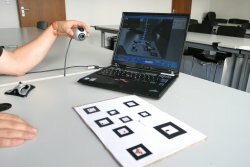 Lectures can be supported by tutorials (Übungen). Tutorials will help the student to deepen the knowledge taught in a lecture. Seminars (Proseminare or Seminare) will train the ability to apply theoretical knowledge to problem solving. Normally, registration to attend a seminar is required, the number of participants is limited. Deadlines for application are indicated in the course descriptions. Assessment is based on different kinds of assessments, like essays, class presentations and written exams. A practical course (Praktikum) is a course, often in a specialized field of study, that is designed to offer students a supervised practical application of a previously studied theory. It consists of two parts, general meetings and practical training. During the meetings, the knowledge necessary to solve the assignements is presented. During the practical training, groups of three to five students will work on complex problems.